This rack connects to the frame of the bicycle so can carry a higher weight without the handling of the bike being affected. For that reason, it more closely resembles traditional butcher's bikes than a handlebar mounted rack. The drawback of carrying weight on the frame rather than having it rotating with the handlebars is the basket (or other load) on the rack must not be high enough to conflict with the handlebars or cables so you may want to raise your handlebars to increase the amount of cargo which you can carry with this rack. The load area of this rack is 40 cm wide x 27 cm front to back. The height of goods or a basket that can be carried will depend on how it fits on your bike. Please consider fitting a taller handlebar stem if you wish to carry a taller load (we also sell tall handlebar stems). As delivered, the fixing requires a downtube frame diameter of 31.8 mm ( 1 1/2" ). The rack can also be used with smaller tubes if you provide a spacer. This should work with most traditional design bicycles including Dutch bikes and English "3 speed" / roadster bicycles. Fitting to an oval tube or different diameter will require some DIY - at the very least a different pair of clamps from those supplied. It may not be possible at all. This rack as supplied can easily be removed from the frame, but a hole is provided for either a padlock or a bolt to secure it permanently. It may be possible to fit this rack to some bicycles with front suspension, though I wouldn't recommend a bike with suspension for carrying heavy loads. Apart from a taller stem, recommended accessories with this rack are a steering damper and a double kick stand. 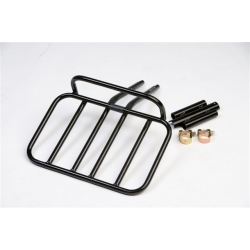 One mounting kit, for one bicycle, is included in the price of the rack. A spare mounting kit for a second bike is also available separately. As with many things, cheaper lower quality copies of these racks exist. Ours are from the original manufacturer made in the Netherlands and they will last many years of heavy use. The rack itself has two versions, aluminium with a 15 kg maximum load or steel with a 25 kg maximum load. Both have identical dimensions. The bracket which fits the bike is of steel.